Now, there's only so much you can really do as far as shortcuts go on an (non-jailbroken) iPhone. But if you're set in your ways and still want some of the saved seconds a neat and tidy app launcher could afford you, Push Launcher is about as close as you're going to get. Push Launcher's a super simple app that does one little thing but does it well; it gives you a means of putting all your most used app in one, easy to access place—your notification center. The app features a (supposedly) intuitive interface that lets you add, delete, and edit apps from your pulldown menu. 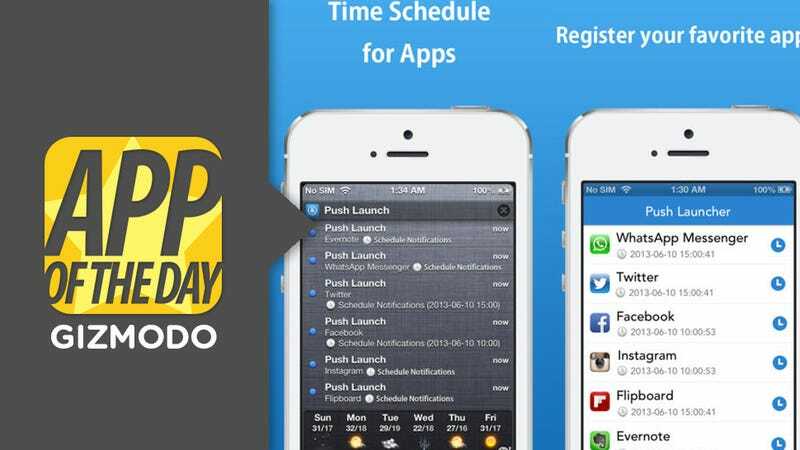 You can even schedule an app to open up on its own using push notifications. So if you know you like to read the New York Times on your phone at a certain time of morning, you can set a push notification to make opening up the app as easy as possible. Admittedly, the app doesn't save that much time , but it is highly convenient for those who get annoyed by all the clicking and swiping and opening and closing it can take. The only problem, really, is that the apps supposedly "intuitive" interface seems to have gotten something wrong, it's a little too easy to pull too far and delete something you only meant to edit or vice versa. Once you get the hang of it, though, using the app is easy enough and pulling down your notification center to access your go-to apps is a delight.